Cut the halibut in to large cubes and finely chop the cilantro. Halve and parboil the potatoes. Mix the mayonnaise, curry powder and cayenne pepper in a small bowl until incorporated. Mix in the cilantro and let chill until ready to serve. Season fish and potatoes with salt and pepper. 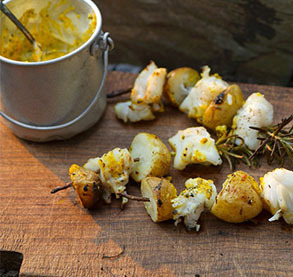 Using the rosemary stalks as skewers, thread the fish and potatoes onto the stalks. Generously grease the grill. Grill skewers for about 10 minutes total, or until fish is cooked through. Turn only once halfway through cooking. Remove from heat and serve with the curry mayonnaise.